My time wasting plans got shifted this week after I received a gift copy of Stick Fight: The Game from my friend, Trevor. He grabbed it for me because my house is the main place where our group of friends get together to play games and it’s a four-player party game. 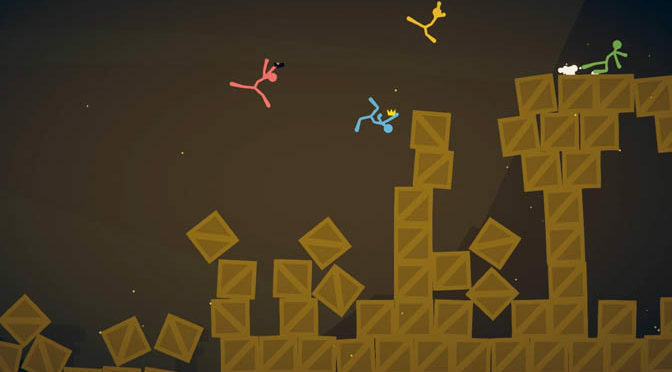 I don’t know if any of you remember those old videos of stick figures fighting that came out in the early days of the internet, but Stick Fight: The Game is basically that. 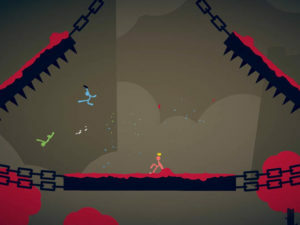 Stick Fight: The Game allows between two to four players to come together in epic brawls to see who’s the best. At the time of writing this, I’ve only got to play it with one other person, but I still had a blast. Four hours of playing this game went by so quickly that I thought it had only been about half that time. Take care not to destroy the entire level while fighting. The controls in Stick Fight: The Game are a little weird to get the hang of, but work well once you do. (Note: I used an Xbox 360 controller when playing.) The player uses the left analog stick to move around and the right analog stick to aim. The left trigger puts up a shield, the right trigger is attack and A is jump. If a player has no weapon, then the right trigger does punches and kicks. There are also several melee weapons in the game that the player can pick up and use, as well as loads of guns. No matter what the player is attacking with, aiming is important. This is because the player can actually aim their melee attacks and doing so is important to overcoming the other player’s defenses. 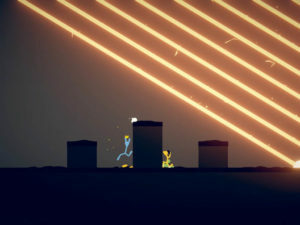 Defending yourself from melee attacks in Stick Fight: The Game is possible in two different ways. The first is to simply attack back. This will result in fists and feet flying and small impact circles appearing where kicks and punches hit each other, but don’t go through for damage. The second option is the shield. Bringing the shield up right as the enemy attacks will result in a counter. This disables the enemy for a second and gives the player using the counter enough time to land a couple of good kits. It can be hard to time, but will completely change the tide of a fight if done right. The counter also works against weapons. It’s the same for melee weapons as with fists, but a little different for anything ranged. Weapons like shotguns, machine guns and sniper riles will appear on the map for players to use. If a person can time it right, they can bring the shield up to deflect bullets from these weapons. This will send them straight back to the person firing. I’ve killed and been killed plenty of times this way, but the risk of taking the hit is high enough to warrant only using it in desperate situations. Using the shield too much also reduces it in size, but it will recharge after a time. There are other weapons that the shield doesn’t stop, but they are mostly special ones. This is includes snake weapons. Yeah, there are weapons in this game that shoot snakes at your enemy. These snakes will attack the closest player, even if that person is holding the weapon they came from. There’s a snake shotgun, pistol, rocket launcher and gatling gun in the game. The rocket launcher actually shoots giant snakes that are even harder to throw off than the normal ones. 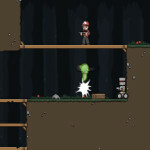 Even if the snakes don’t kill, they add an extra distraction for the players and can easily drag them down pits to their death. There are loads of levels for players to enjoy in Stick Fight: The Game. The game chooses the levels randomly and there are some that stick out more than others. 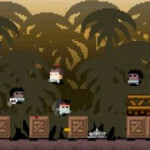 For example, some of the levels contain boss fights, but it isn’t what you’re thinking. In these select levels, a mask will start floating down from the ceiling a few seconds into the match. The first player to touch this mask will turn into a boss that the other players have to try to defeat. 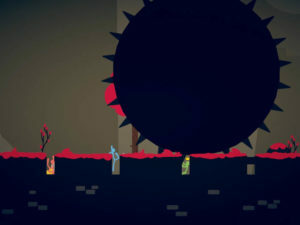 There are three different bosses in the game and each one has a variety of attacks. These levels do a great job at mixing up the gameplay and really turn this game into a bullet hell when they show up. It can also bring players together in a common goal, which is a nice twist. The boss levels may be what left a major impact on me, but there are tons of other fun levels to enjoy. This includes ones that have players wall jumping (yeah, that’s a thing) and attacking each other over pits of lava, trying to shoot chains holding the other’s platform up, taking shots at each other on a spinning windmill and more. There’s just so much variety and it all keeps the game feeling fresh hours later. During my time playing, I think there were only a couple of levels that I didn’t really care for. The graphics in Stick Fight: The Game are simple, but they work well. The stick figures are plain, simple colors with no details to them. 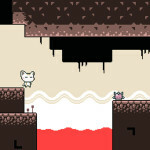 However, the backgrounds and levels do have details and it helps the player’s character pop out more. This makes it easier to keep track of yourself and the other players during all the hectic action. The audio in Stick Fight: The Game is great. Different level types have their own music and there’s even special audio for the boss fights. The sound effects also all match up well with the action and are never too overpowering, but still sit at the forefront over the music. The only issue I’ve ever really had is the boss music lasting after a stage was complete. It got incredibly loud after this, but everything goes back to normal with the next level. Overall, Stick Fight: The Game is a superb game to waste some time with. It’s great to play if you have a group of friends hanging out. There’s also an online mode if you and your buddies don’t live near each other. However, I would highly suggest playing it with all the people in the same room. Just don’t let the fights in the game break out into the real world. The asking price of $5 also makes this an easy game to recommend. 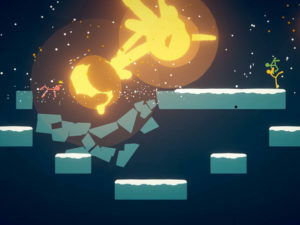 Stick Fight: The Game earns 4 GiN Gems out of 5!